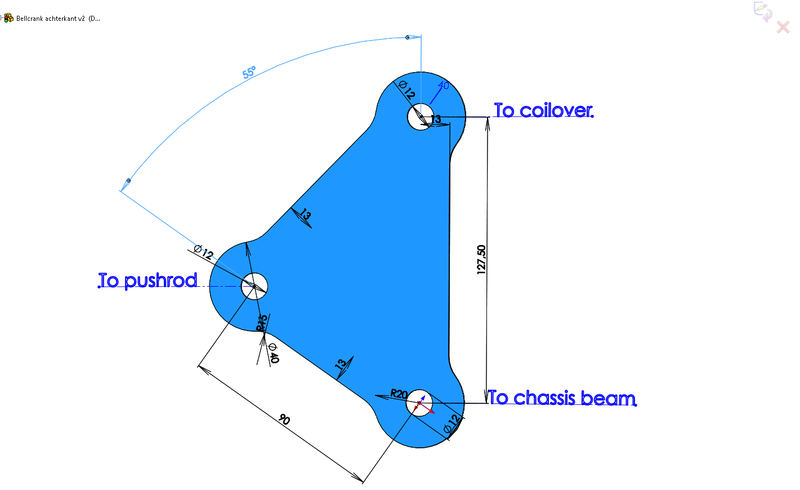 Calculating the rear geometry and motion ratio. 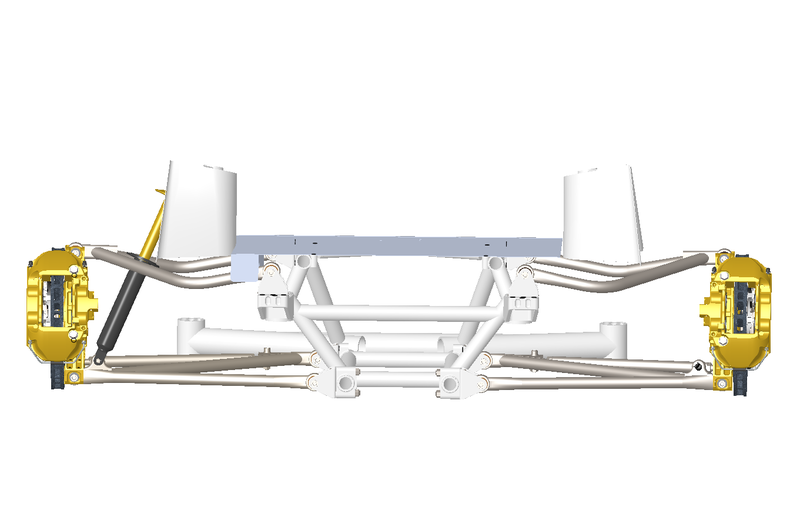 In 2015 I drew the complete rear suspension up in Solidworks. Although most of the work was already finished, Solidworks is a great tool to design the missing rear coilover mounting points and quickly calculate how much difference various U brackets make. The mounting of the coilover is not a matter of simply welding on a fitting to the lower arm and attaching the coilover to it, as there’s a motion ratio to take into account. The motion ratio of a coilover defines the actual wheel travel compared to the travel of the coilover. 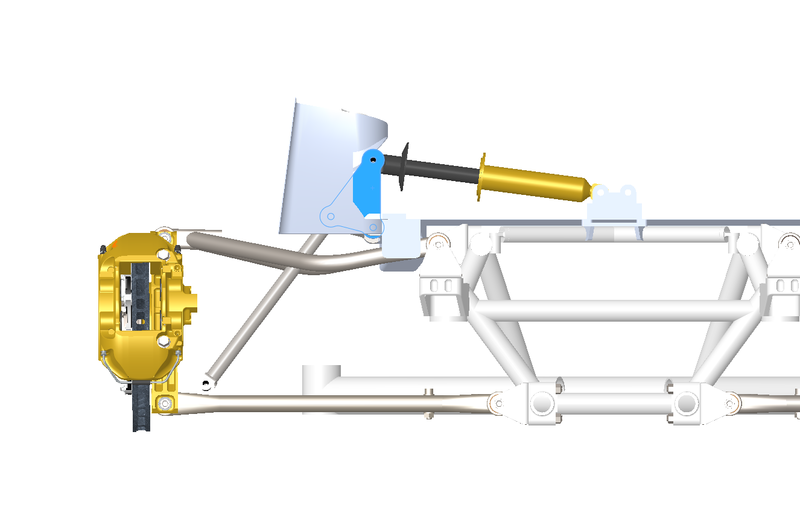 If the coilover is mounted directly to the suspension knuckle, and stands vertically straight up it will move the same distance as the wheel, creating a 1:1 motion ratio. However, by fitting the coilover to the lower arm, or placing it at an angle, it will travel less decreasing the motion ratio. As a result, the shock and spring need to be stiffer, reducing their ‘sensitivity’. Also, the larger load acting upon the coilover may demand stronger mounting points. Most factory high performance cars use a direct fit to the knuckle for a 1:1 ratio on the rear suspension, and I wanted to apply this to my setup as well. I’ve never encountered a setup where the motion ratio was positive actually, but often negative ratio’s. Although most modern high performance and race cars run a 1:1 ratio, there are exceptions. The Nissan and Ferrari suspensions seen below run a ratio that I would estimate at around 0.80 – 0.72. In both cases though, the decision seems to have been compromised due body design (in the Nissan most likely aerodynamics and space on the Ferrari). I used Solidworks to see what would happen if I would hook up the rear shock to the lower arm and the factory mounting point in the suspension tower. 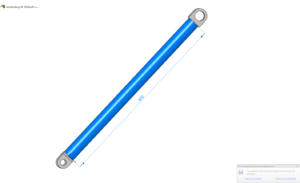 As can be seen, the motion ratio for this coilover is also well under 1:1 at approximately 0.80. 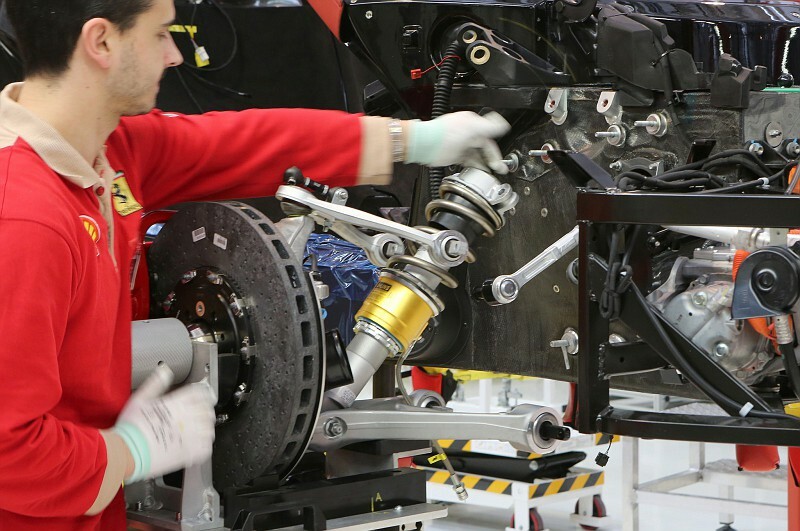 However, the shock interferes with the upper control arm. This can be corrected by moving the coilover mounting on the lower arm more inwards. However, this will further drop the motion ratio to an undesirable 0.70. Motion ratio’s on my front and rear systems. 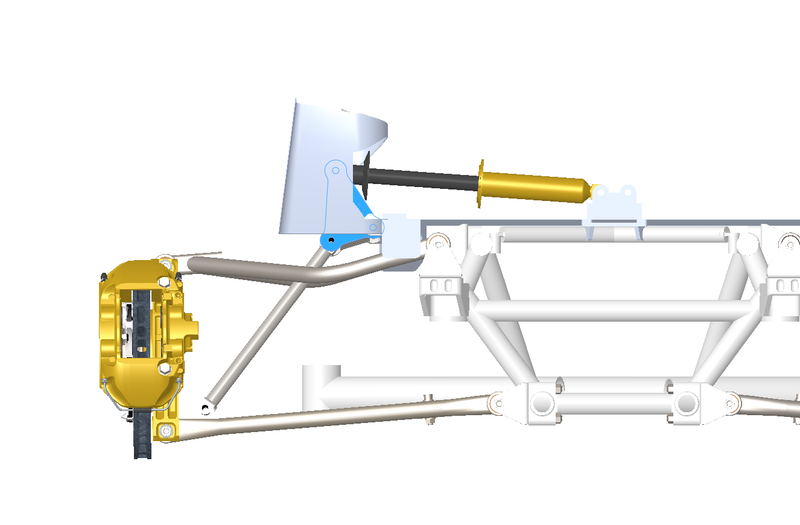 Though I built the rear system first, the completed design for the front suspension was finished first. 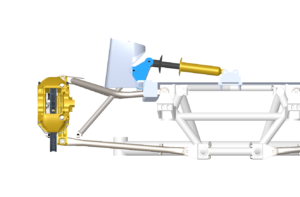 Since the front suspension required a bellcrank suspension, I added some progressive resistance (see the front suspension page for more details on this) to the motion ratio, set at 1:1 on ride height. 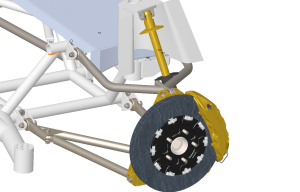 I wanted to use an equal motion ratio for the rear, although a progressive setup for the rear wheels can be different. While the front end may dive under hard braking, the rear wheels would only see ‘diving’ under full acceleration. 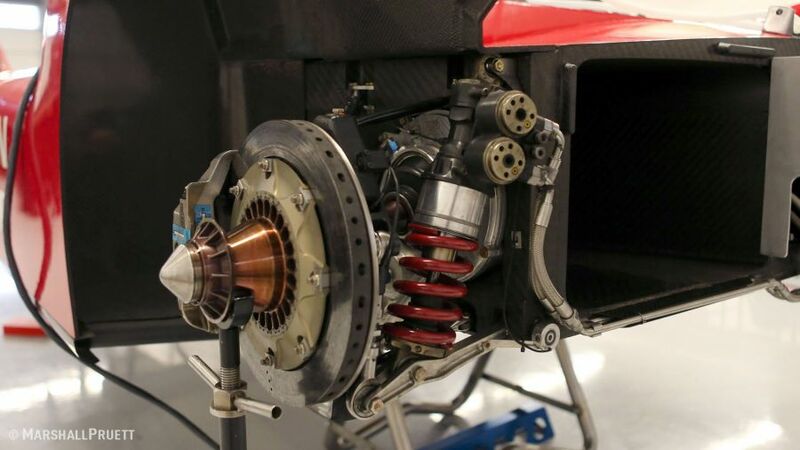 But this force will be far less since the brakes are not only capable of decelerating the car much faster than it can accelerate, most of the weight sits at the front adding to the diving effect as well. However, if the car reaches higher speeds and sees downforce, I prefer to have similar (progressive) motion ratio’s on both ends, in particular since the rear end of the car may receive more downforce. Should my theories and/or calculations be wrong, I can easily change the pushrod and bellcrank designs and leave the expensive coilovers unchanged. This is one of the greatest advantages of a bellcrank suspension. 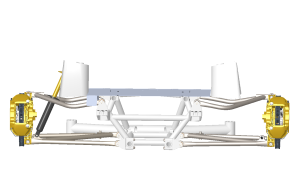 Since fitting the coilover directly to the lower arm was ruled out, I set out to design an inboard setup. I made an additional 4 bolt mounting point on top of the subframe, so I used this as the central mounting point for both coilovers. The bellcrank is mounted to a pivot welded to the chassis beam, and further reinforced by an additional frame (not visible in the pictures below). 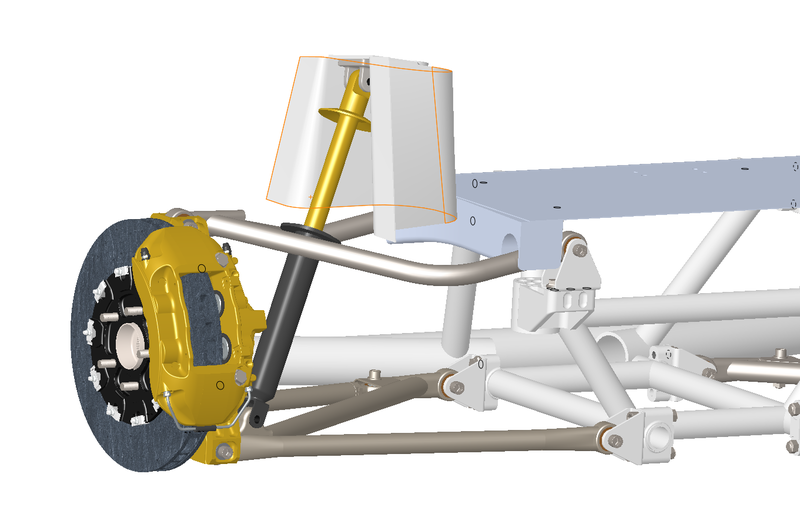 Similar to the front suspension, I designed the system with 100mm wheel travel. 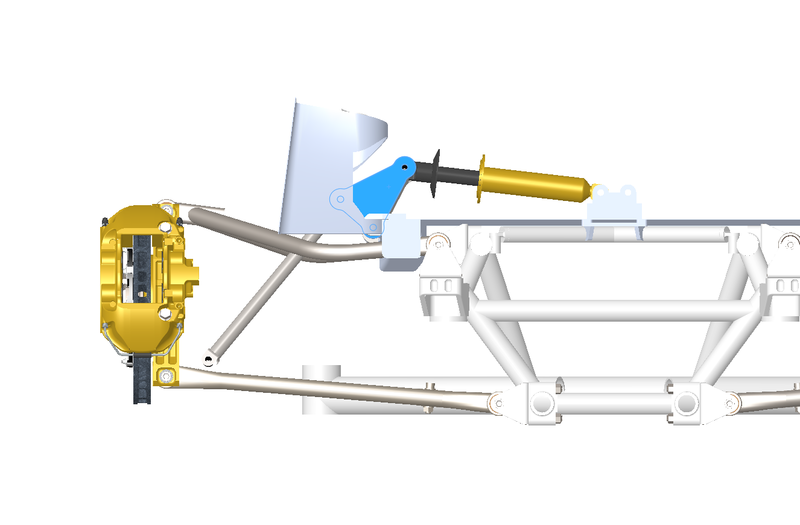 The mounting pivots for the coilover and bellcrank to the chassis as well as the lower control arm mounting for the pushrod are fixed. Therefore, any changes made are done by adjusting the length of the pushrod and/or adjusting the design of the bellcrank. 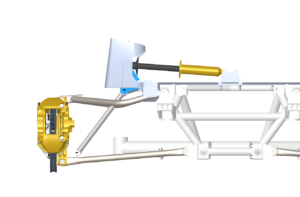 On this bellcrank I adjust the main angle from the pivots of the pushrod to chassis beam and coilover to chassis beam, 55° as pictured below. There are 3 ways to alter the motion ratio and the progressive or regressive effect. 1: By changing the bellcrank angle, the motion ratio is largely unaffected but the regressive or progressive effect is altered. 2: The distances between the bellcrank pivots can be adjusted, altering the motion ratio, with little effect to the regressive/progressive behaviour. 3: The length of the pushrod, affects the arc in which the bellcrank moves and with that the progressive or regressive effect. 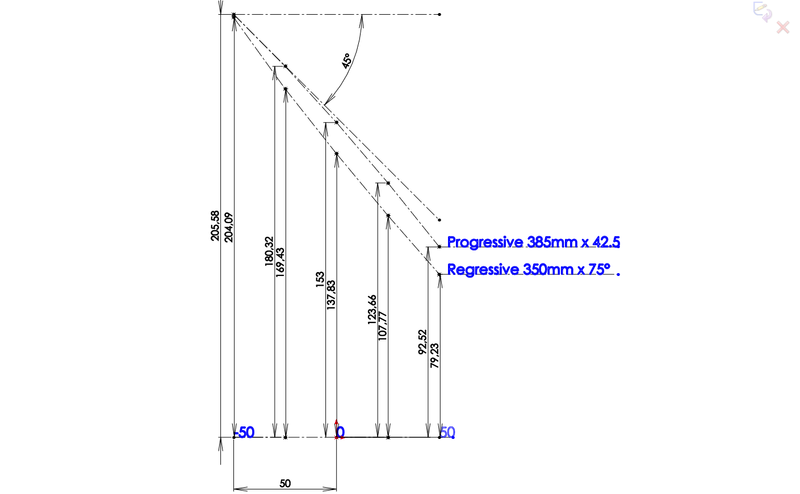 Finding the right combination of angles and dimensions starts with a design I visually estimate to be as close as possible. Apart from the motion ratio and progressive rates, the physical limitations of the parts and space among the car itself need to be taken into account. Pictured below are the first 2 samples of different bellcrank/pushrod combinations, that I won’t use but show the differences well. 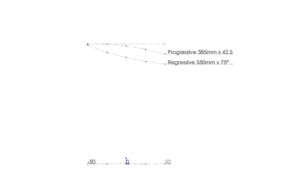 Both have a positive motion ratio, but one is regressive and the other progressive. The progressive system uses a 42,5° bellcrank with a 385mm long pushrod, the regressive system a 75° bellcrank with 350mm pushrod. The pivot distances are 80/127,50mm and for both the same. The 2 setups look very much alike but lead to vastly different motion ratio’s. 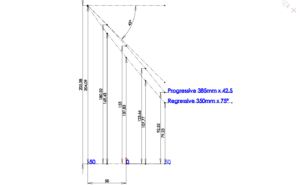 In the graph below coilover travel is measured @ -50, -25, 0, 25, and 50mm wheel travel, which naturally leads to a decending line from left to right. If the motion ratio was exactly 1:1 and stayed that way, the entire line would have an exact 45° angle. However, to make the graph more easy to read I add the wheel travel to the coilover travel. As a result, the line shows up horizontally, that is, if the motion ratio was 1:1. Now the progressive/regressive effect can be seen very well. The regressive line can be rejected immediately. 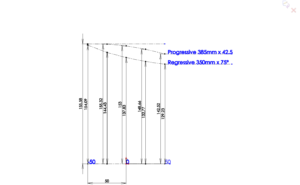 The progressive line has an almost exact 1:1 motion ratio from -50 to -25mm travel, gaining only 0.26mm additional motion, an increase of just 1,01:1. From there on the added coilover travel rises to 2,58mm @ 0mm travel (1,10:1), 6,92mm @ 25mm travel (1,28:1) and 13,06mm @ 50mm travel (1,52:1). Such an aggressive setup would be useless. The progressive effect has to be reduced, which led to a number of tests as pictured below in the graph. Starting with the previous progressive line B, the pivot distances were increased from 80/127.50 to 87/130 showing up as line C. The progressive effect was still too strong, so for D the pivot angle was increased to 45° and the pivot distance adjusted to 90/130. The result was pretty good, and to get an even better view the coilover travel was measured per 10mm. However, I wanted to have the motion at 0mm wheel travel slightly closer to 1:1, so for E I further adjusted the pivot distance to 95/130mm. The effect was too great, so for F the pivot distance was adjusted to 91/130mm. Line F is the one I’ll be using for the final design. In comparison, the front suspension coilover travel was displayed above it. The ratio from 0-50mm wheel travel is almost identical, 0,45mm to 5,94mm for the front and 0,30mm to 5,21mm for the rear, an increase of almost 10% vs 11% for the front. 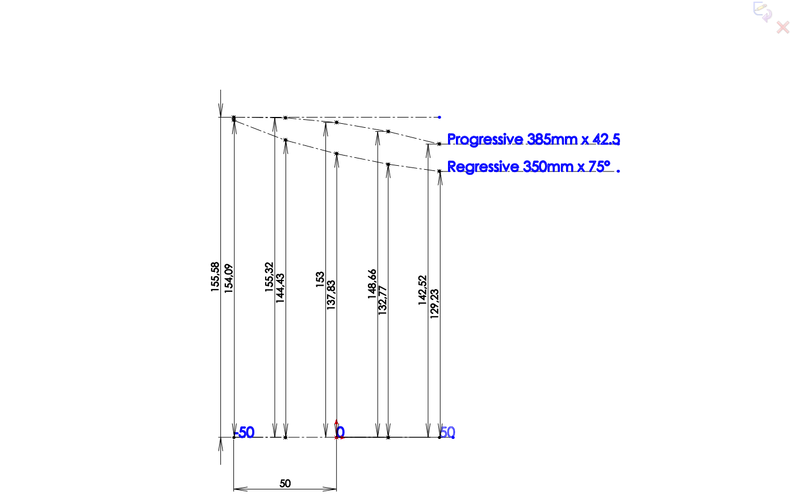 Should I want to increase the progressive effect more on the rear, I can return back to design D which ends at 11%. 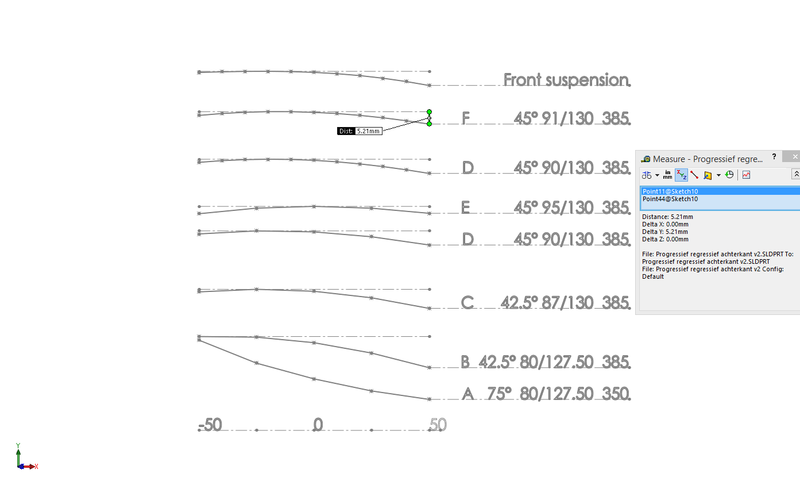 Noticeable in the graph is that the line of the front suspension has a very flat curve from -50 to 0mm wheel travel. 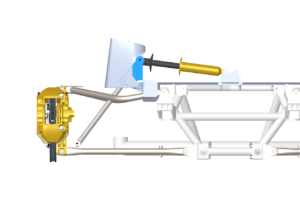 This is the result of the rather different angle at which the bellcrank operates and the length and placement of the pushrod on the front suspension. Such a curve simply can’t be reproduced on the rear suspension no matter how it’s adjusted, this is as the rear coilover, bellcrank and pushrod remain parrallel.